Update: Google has provided more information regarding the down time. "We've determined that this issue affected less than 10% of the Google Mail users who attempted to access their accounts during the affected timeframe. While we have resolved this issue with Google Mail, it's possible that some users may experience message delays because affected accounts weren't available to receive messages. The messages will be successfully delivered after account access is restored." For those who've been spending their lives in the cloud, it would appear it's time to come back down to Earth -- Gmail briefly went down Tuesday. The popular email service took a nose dive around 9:42am PST. Although social media sites like Twitter were abuzz with vivid stories of horror and lament, the interruption lasted about one our. As of 10:45am, everything appears to be back to normal. The outage appeared to be a global failure, even affecting the likes of Justin Bieber, although other core Google services seemed unaffected. Instead of users being presented with a login page or their inbox, users were greeted with a server-side error labeled, "Temporary Error (500)". The message said, "We're sorry, but your Gmail account is temporarily unavailable. We Apologize for the inconvenience and suggest trying again in a few minutes." Additionally, the service interruption also seemed to affect users who rely on IMAP or POP as neither mail protocol was allowing access to Gmail. It may be worth noting that although my own personal Gmail account was down, my Google Apps email account remained functional and suffered no interruptions. 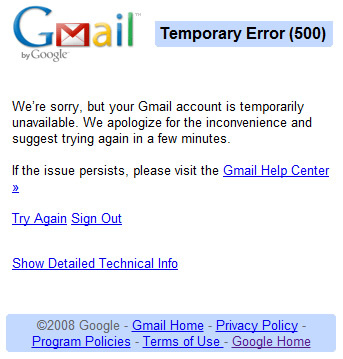 As a result, the outage seems to have simply been isolated to Google's consumer email service. This is certainly not the first outage Gmail has faced, nor the worst. When the service first rolled out in 2004, it was plagued with long and painful down times. While things have dramatically improved since then, in 2011, Gmail users suffered an unusually long outage which also resulted in a harrowing loss of email for some Gmailers. Several years ago, Google introduced a status dashboard which gives users a quick way to check whether Google services are functioning properly.